In Say Boo!, Ben the ghost is practicing his scariest “boo” for Halloween night, but it comes out mixed up most of the time. 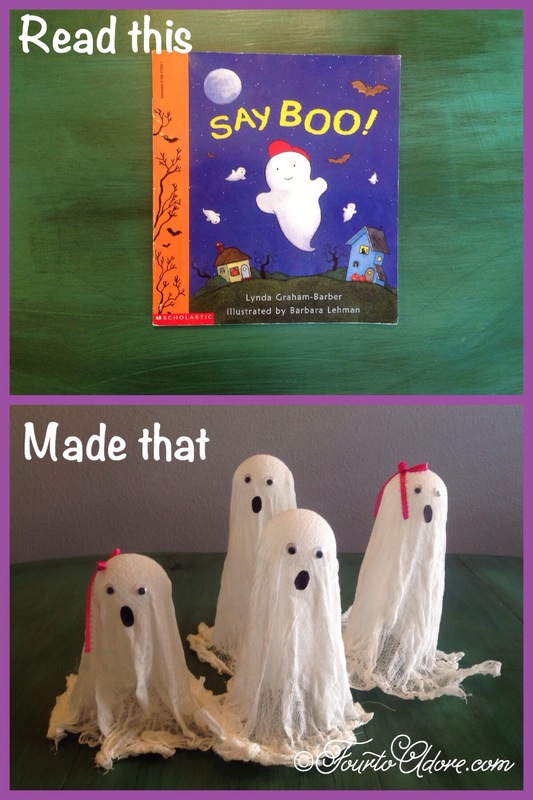 In case you were wondering, ghosts don’t say “moo” or “coo”, they say, “Boo!” Even though we already made wispy ghosts, another ghost craft was in order for this story. I’ve always wanted to try my hand at cheese cloth ghosts, but never attempted them. I found simple directions at One Good Thing by Jillie to try. I created a form using ball pit balls taped to paper towel rolls, which I secured onto paper plates. Then, I covered the form with two layers of cheesecloth. The quads helped by spraying the cheesecloth with liquid starch until they were soaked. I set our soppy figures in the sun to try for 24 hours. The next day, I dotted glue on the tops of the forms and let the quads stick googly eyes and oval mouths on them. I think they are adorable! In fact, I’ll try to pack them up to use for next year’s decor.